Tag line: "Devil's sorcery, as a dead man returns for vengeance!" We open with a close-up of a book titled “History of Vampires”, which is resting on a table. Suddenly, a hand reaches in, picks the book up, and tosses it onto a fire. As we watch it burn, a strange, somewhat sinister face appears on-screen, saying “You creatures of the light, how can you say with absolute certainty what does or does not dwell within the limitless ocean of the night?” He continues for a minute or two, talking of “witches and warlocks, werewolves and vampires, and all the spawns of hell”. It’s a wordy, flamboyant introduction to 1943’s Dead Men Walk, a Poverty Row production notable for its cast, namely veterans George Zucco (playing two different characters) and Dwight Frye (a supporting actor, and an important one, in both Dracula and Frankenstein). The face from the opening scene of Dead Men Walk belonged to Elwyn Clayton (Zucco), who, as the movie begins, is already dead. A student of the occult who worshipped the Devil himself, Elwyn was a menace to society, so much so that his own brother, Dr. Lloyd Clayton (also Zucco), murdered him when he threatened to convert their niece, Gayle (Mary Carlisle), into a follower of the dark arts. Now that Elwyn is dead, Gayle is free to live a normal life and marry Dr. David Bentley (Nedrick Young), an up-and-coming physician who occasionally assists Dr. Clayton. Unfortunately for them all, Elwyn Clayton learned a thing or two about dark magic over the years, and with this help of his hunchback assistant Zolarr (Frye), he returns to life as a vampire. Looking to avenge his own death, Elwyn visits his brother and vows to turn Gayle into a vampire as well (which he begins to do almost immediately, slowly draining the blood from Gayle’s body over the course of several nights). Refusing to believe Dr. Clayton when he says his brother has returned, Dr. Bentley accuses his mentor of trying to kill Gayle, and threatens to do the same to him if she should die. Can Dr. Clayton defeat Elwyn and save his beloved niece, or will he himself be blamed for a murder he didn’t commit? Released by PRC, the same poverty row studio behind 1940’s The Devil Bat, Dead Men Walk is a low-budget horror / thriller that, at times, reminded me of the classic monster films produced by Universal in the 1930s (the scene where Zolarr exhumes Elwyn Clayton’s casket is particularly well-staged, with plenty of shadows and a low-hanging fog that envelops most of the set). Aside from its atmosphere, Dead Men Walk also boasts some impressive performances. George Zucco (The Cat and the Canary, The Mummy’s Hand) shines in the dual role of the kindly Dr. Clayton and his sinister brother Elwyn, but what drew me to Dead Men Walk in the first place was that it featured Dwight Frye, who, as he did in Dracula and Frankenstein, plays an assistant willing to obey his master’s every command. While he doesn’t quite match the intensity he brought to the earlier films, it was good to see Frye again all the same. Despite a handful of deficiencies, including a few slow patches in the middle and an over-abundance of dialogue (at a key moment, the resurrected Elwyn is standing over Gayle’s sleeping body, but instead of going straight for her throat, he delivers a speech to…. 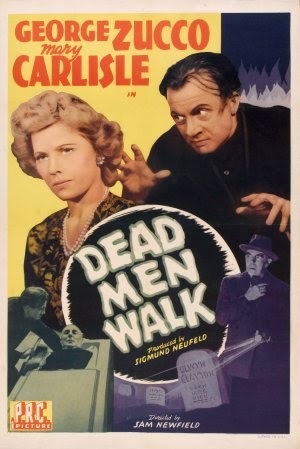 well, himself, seeing as he was the only one who could hear it), Dead Men Walk is a fun ‘40s flick that fans of classic horror won’t want to miss.